Six residents volunteered to help the Montgomery Area Food Bank and the Caring for Citizens of Alabama organization pack and distribute food to 300 needy households. 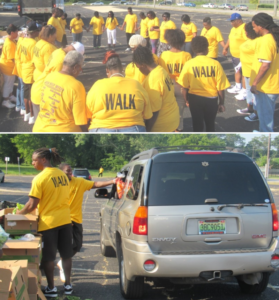 The Food Bank annually distributes over 20 million pounds of food to 35 of Alabama’s 67 counties. Below Residents Frederick Hill (left) and Marquil Jackson distribute products to residents. The volunteers preceded the giveaway with a prayer.